TWO FIRST-HALF GOALS moved Cabo four points clear of Cobh in seventh position in the SSE Airtricity League First Division. Jack Watson gave the hosts the lead when he got on the end of a cross following a clever dummy by Marty Waters, and it was Waters who once more played a key role in the second: he was taken down for a penalty which was duly stuck away by Kevin Knight. 3 points and a clean sheet for Cabinteely with a 2-0 win. Jack Watson and Kevin Knight with our goals. We travel to @GalwayUnitedFC next Friday night. Baba Issaka’s header for the visitors wasn’t quite enough to inspire an Athlone comeback as Drogheda capitalised on results elsewhere to move into second position outright. Luke Gallagher fired home from the edge of the box and Colm Deasy powered in a header from a corner to keep the Drogs within touching distance of table-toppers UCD. Athlone remain rooted to the bottom of the table on five points. Goals from O'Connor and Mahdy secure a huge three points for the leaders! The Students maintain the five-point gap! After Daire O’Connor gave the students a second-half lead in Roebuck, pouncing on a blocked effort to fire home from close range, Yousef ‘Yoyo’ Mahdy rubber-stamped UCD’s superiority not only over Galway, but the division as a whole, putting the finishing touches on a superb team move. 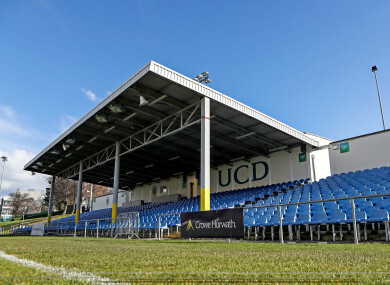 UCD remain five clear atop the First Division table, while Galway remain in sixth spot. A third draw between Harps and Shels this season did neither side much good as they lost ground on Drogheda. The Donegal and Dublin clubs might well wind up meeting in the play-offs. It was Harps who came closest to breaking the deadlock with one header tipped over the bar and a chance cleared off the line shortly afterwards, but there wasn’t a great deal of action on a tense night at Finn Park. Email “UCD extend First Division lead as Harps and Shels play out third draw of the season”. Feedback on “UCD extend First Division lead as Harps and Shels play out third draw of the season”.